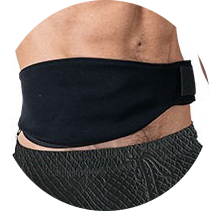 All of our adjustable Stealth Belts are considered peristomal hernia support belts, but there are some that come more highly recommended than others when doing weightlifting with an ostomy. The Hybrid Stealth Belt has a strip of neoprene across the center of the belt, which allows you to tighten the belt down with more security that a standard pro style. This is one of the favorite belts for those who enjoy weight lifting and high intensity activities, such as rugby player Trey Johnson. In conjunction with wearing an ostomy support belt, you should ensure that you use good form and gradually strengthen your core to help prevent hernias. Make sure to check with your doctor before starting a weight lifting regimen.